ATLANTA — Georgia Republicans tapped Brian Kemp to face Democrat Stacey Abrams in the Georgia governor’s race, setting a November matchup that will test history and highlight the widening gulf between two major parties moving further apart in style and substance in the era of President Donald Trump. 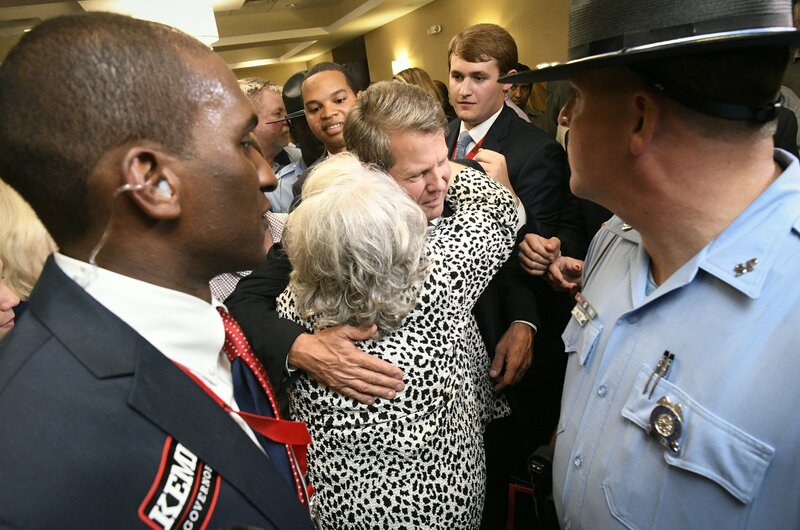 Kemp, a two-term secretary of state, trounced longtime Lt. Gov. Casey Cagle in a runoff Tuesday after campaigning as a “politically incorrect conservative” who welcomed Trump’s endorsement in an intraparty tussle marked by hard-line rhetoric on guns, immigration, and government spending. Abrams, who has become a national Democratic celebrity in her bid to become the United States’ first black female governor, dominated her primary in May, pledging to expand Medicaid insurance and spend more on education, infrastructure, and job training. The results mean animated bases on the left and the right, leaving voters who consider themselves somewhere in the middle to decide one of the country’s most closely watched midterm contests. Both national parties opened their coffers ahead of Tuesday’s GOP runoff; and the outcome will reverberate into 2020 as Democrats try to prove that GOP-controlled Georgia, after decades of population growth has made the electorate more urban and less white, has evolved into a presidential battleground. Will a Deep South state — led by white, male governors since 1776 and not long removed from having Confederate insignia on its flag — elect as governor a self-declared progressive black woman from Atlanta as its chief executive? Or will an increasingly urban, diversifying state — now the eighth most populous and home to The Coca-Cola Company, Delta, Home Depot, UPS and the 1996 Summer Olympics — embrace the brash, gun-wielding, chain saw-cranking Republican who says he’ll “round up criminal illegals” in his own pickup truck? Kemp, 54, immediately set the race against the national backdrop, thanking Trump for his endorsement while linking Abrams’ to a “radical left” he says threatens Georgia’s “red-state” values. “Do you want a governor who is going to answer to Nancy Pelosi and Hillary Clinton?” Kemp boomed in his victory speech, referring to the House Democratic leader from California and the 2016 presidential nominee who lost Georgia by 4.5 percentage points. Republicans like party strategist and pollster Mark Rountree argue that Abrams’ policy agenda means higher taxes — anathema to suburban voters she’ll need. Rountree said her support for removing Confederate monuments from state ground will ensure conservative turnout. Still, some Republicans lamented that a long primary battle will leave their nominee broke. “Casey’s spent all of his bullets on Brian and vice-versa, while Stacey Abrams is just collecting money,” said Jack Kingston, a former congressman who endorsed Cagle. At the least, the matchup deviates from Georgia’s recent penchant for establishment, predictable governors, regardless of party. Outgoing Republican Gov. Nathan Deal — who once served north Georgia as a Democratic congressman — backed Cagle over Kemp, a tacit acknowledgment that Kemp is to the right of the typical GOP governor here. Four years ago, Democrats nominated Jason Carter, a grandson of former President Jimmy Carter, himself a former governor, but the younger Carter lost to Deal by 8 percentage points. This year, many of Carter’s old-guard backers initially sided with Abrams’ primary opponent, also a former state lawmaker. Stacey Evans hammered Abrams for making too many deals with Republicans — including Deal — but party elders still viewed Evans, who is white, as the more moderate choice.